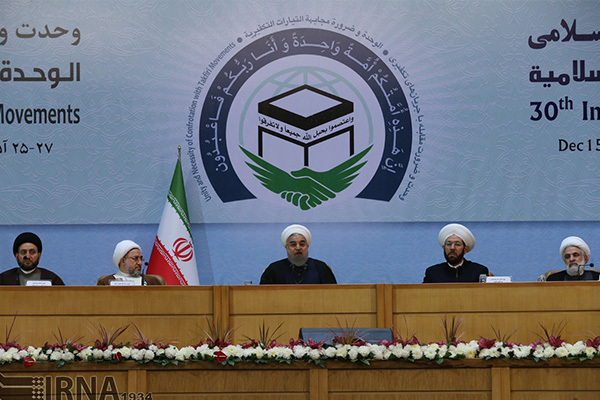 The 30th edition of Islamic Unity Conference was kicked off on Thursday by President Hasan Rouhani in Tehran with religious thinkers and elites from more than 50 countries across the world in attendance. According to a report by IFP, this year’s conference is being held with the motto of “Unity, Necessity of Countering Takfiri [extremist] Movements”. The unity event this year is centred on the ways of countering Takfiri groups for boosting unity among Muslims and braving the problems the Muslim world is mired in. The role of Takfiri currents in fomenting discord among Muslims, the need for countering Takfiri currents in order to realize Islamic unity, the threat Takfiri currents pose to keeping alive the issue of Palestine, and the Zionist regime of Israel’s use of Takfiri currents are among the topics discussed at the three-day event. Attended by prominent members and thinkers from Malaysia, Russia, Indonesia, Iraq, Lebanon, Thailand, UK, Australia, China, etc., the event provides the grounds for its attendees to exchange their views for sorting out the standing setbacks Muslim nations are mired in. Over 300 domestic and foreign guests, a number of clerics from different countries and 220 prominent figures from across the Islamic world have participated in the international Islamic event. The three-day International Islamic Unity Conference is to review problems faced by the Islamic Society (Ummah) and find appropriate solutions to address such issues. The 30th Islamic Unity Conference will last until December 17 and is to discuss the practical roadmaps for braving the problems and setback Muslims are wrestling with, ABNA reported. Islamic unity conference is mounted so as to promote unity of the Islamic society which has been a major axis in the thoughts of many leading Muslim intellectuals worldwide. The 17th day of the month of Rabi al-Awwal in the lunar Hijri calendar is believed by Shiite Muslims to mark the birth anniversary of Prophet Mohammad (PBUH), while Sunni Muslims regard the 12th day of the month as the birthday of the last prophet.